Application & Characteristics: For bonding of PVC, rubbers, leathers, PU, TPR, nylons and etc. Strong initial bonding strength. Application & Characteristics: For bonding of PVC, rubbers, leathers, PU, TPR, nylons and etc. Good initial bonding strength and yellowing resistance. Application & Characteristics: For bonding of PVC, rubbers, leathers, PU, TPR, nylons and etc. Excellent workability and long tack retention time. Application & Characteristics: For bonding of Soles made of PVC, PU, escolite, rubbers, TPR, leathers, nylon fabrics uppers.xcellent initial bonding strength and fast drying. Application & Characteristics: For bonding of soles made of PVC, PU, escolite, subbers, TPR, leathers, nylon fabrics uppers. 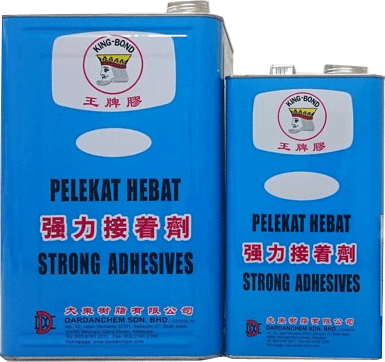 PU338BA is a two parts solvent-based polyurethane adhesive. Excellent initial bonding strength and suitable for Roller-coating. Application & Characteristics: For bonding of nylon and fabrics textile. Long tack retention time. Application & Characteristics: For bonding of Soles made of PVC, PU, escolite, rubbers, TPR, leathers, nylon fabrics uppers. Excellent initial bonding strength and fast drying. Application & Characteristics: For bonding of Soles made of PVC, PU, escolite, rubbers, TPR, leathers, nylon fabrics uppers. PU338KB is a two parts solvent-based polyurethane adhensive. Excellent initial bonding strength and suitable for Roller-coating. Application & Characteristics: For bonding of PVC, PU, rubbers, TPR, leathers, nylon etc. Strong initial bonding strength. Application & Characteristics: For bonding of PVC, PU, rubbers, TPR, nylons and leathers, etc. Good initial bonding strength and fast drying.